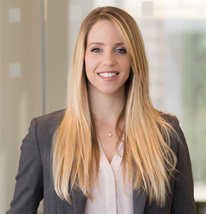 Lindsey joined Bourne Partners in the summer of 2015. She manages all facets of Bourne Partners’ marketing activities from inception to execution. She works interchangeably with the Research and Business Development teams to create and share branded content to properly communicate the value of Bourne Partners. This encompasses email marketing, event marketing and management, advertising, creation and promotion of printed and digital materials, social media outreach and PR. Prior to joining the firm, Lindsey served as Lead Project Coordinator for Civilwrx Inc., an engineering and infrastructure construction company in the Communications sector. Lindsey received a B.S. in Education from Indiana University with a concentration in Health. Outside of work Lindsey enjoys spending time with friends and family, staying active through various outdoor activities and adventuring with her goldendoodle pup, Indie. On a great day, you will find her on a plane traveling toward a destination she’s never been.